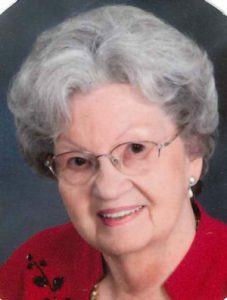 Doris Eugenia Dorsey, 99, Winona Lake, formerly of North Webster, passed away at 3:50 a.m. on Sunday, March 24, 2019, at Grace Village Healthcare in Winona Lake. She was born on Nov. 2, 1919, in Kosciusko County to Elmo and Florence (Weimer) Shock. She graduated in 1936 from Syracuse High School and was a lifetime Syracuse and North Webster area resident until moving to Grace Village in Winona Lake in 2009. She was married on June 6, 1936, to Maurice William Dorsey who preceded her on Nov. 29, 2001. She was a homemaker and retired as the Cafeteria Manager at Syracuse School after several years. She is survived by two daughters: Dixie Simmons, Syracuse; and Kathleen (Bruce) Wolfe, Middlebury; son: William “Bill” (Marilyn) Dorsey, Columbia City; seven grandchildren; seven step grandchildren; several step great grandhicldren; four great-great grandchildren and several step great-great grandchildren. She was preceded in death by her parents, husband, sister, D-Maris Miller, and brother, Joe Shock. Visitation will be from 11-1 p.m. Friday, March 29, at Owen Family Funeral Home, SR 13 and CR 500N, North Webster. Funeral services will be at 1 p.m. on Friday in the funeral home with Pastor Bob Wyman of the church officiating. Burial will follow in the Mock Addition of the North Webster Cemetery.